Capacities possessed by “Riviera” hotel strike with its diversity, affordability and novelty. And you might find it worthwhile ordering visiting wedding registration within the walls of “Riviera” hotel…For instance, the zest of “Riviera” hotel – the tallest building in the city – is its viewing point where the registration takes place at the warm time of the year…Marriages are made and hearts are joined forever right below the clouds on the 25th floor at the height of 100 meters. 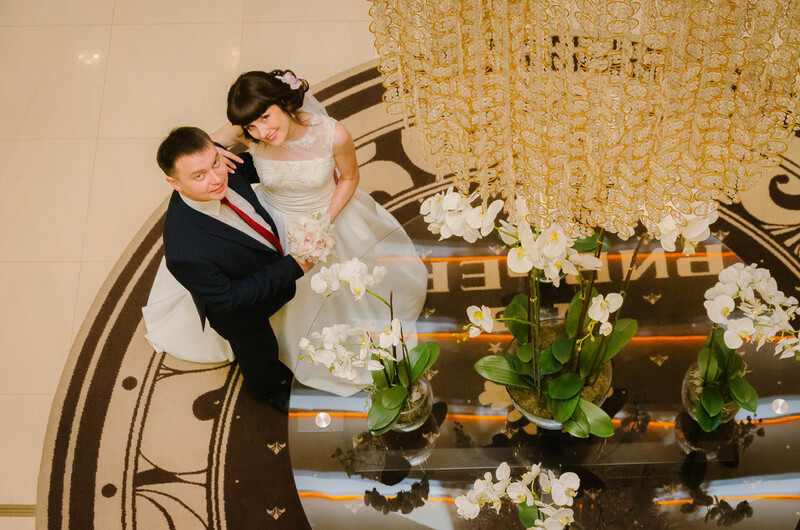 Glorious wedding ceremonies “in heaven” with flowers and treats, smiles and delights has long before become the pages of numerous family albums. Whereas the viewing point of “Riviera” hotel has become the stepping stone for many happy couples! One can have the wedding banquet in “Amore” restaurant which is located on the 1st floor of “Riviera” hotel. Your guests will be delighted and to see the true value of European and national cuisines, whereas the exquisite interior and rich decoration together with excellent chef’s specialties will remind you and your guests the world cinematography shots. The names of banquet rooms of various capacity, where one can have an unforgettable wedding banquet, speak for themselves: Breeze, Lagoon, Cote d’Azur, Admiral’s…Whichever choice you make, you will get an impeccable service, helpfulness and consideration of staff…That is the unique feature of “Riviera” wedding: spending menu, first-class services and wide range of provided services are combined with reasonableness and loyalty of prices for each young couple. By the way, you can also have a wedding registration in any of the mentioned banquet rooms. Many people know firsthand how anxious the newly married couple is to leave the guests that are enjoying themselves and to finally stay together alone with their love and tenderness for each other away from noise and fuss. “Riviera” hotel gives the newly married couple a wonderful gift – the first and the most memorable night of a new-born family will take place here within "Riviera" hotel walls in one of its cozy rooms with a compliment from the hotel waiting for the just married couple. As always, the cost of accommodation already includes Buffet breakfast, a visit to aquapark and a visit to 5D-cinema.